Tower cranes are being installed in what will be the world’s first building to reach – and exceed – 1,000 metres. 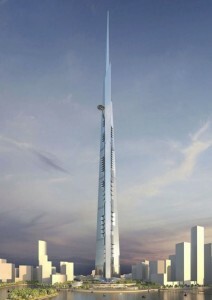 Construction on the Kingdom Tower in Jeddah, Saudi Arabia, began earlier this year, and at over a kilometre high it will dwarf the current highest building – the 828 metre high Burj Khalifa. Six luffing jib tower cranes will be used on the building, including three Liebherr 280 HC-L 16/28 and a 357 HC-L 18/32 Litronic with jib lengths of between 40 and 45 metres. The maximum loads to be lifted will be between 11 and 12 tonnes at 35 metres radius. The three 280 HC-L will be anchored to the outer sides of the building on several cantilevered platforms, and reach hook heights of around 400 metres, while the 357 HC-L will climb all the way to the top, possibly creating a new record for the highest crane.